When young cat Simon is smuggled on board a ship, he never imagines his quiet little life will soon become an adventure fit for heroes. With new friend Peggy, the ship’s dog, he bravely fights King Rat and his gang, rescues the crew, and shows the joy an animal can bring to our lives. 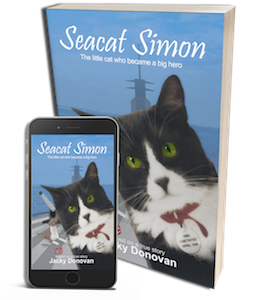 Winning the hearts of the sailors and people across the world, Seacat Simon’s inspiring and moving true tale of love, friendship and adventure is sure to enthrall a new generation of children. “An action packed read, rich in detail, harrowing in places, heart-warming in others, and with a beautiful ending.” Sheila Jeffries, author of “Solomon’s Tale”. Jacky Donovan might not have nine lives, but she does have a few. Bored with being a ‘Stepford’ housewife in Southampton, Jacky packed her bags and headed to London over a decade ago. She’s now an established author and, more importantly, curious about cats and dogs. The first book in her Animal Heroes series, Simon Ships Out: How one brave, stray cat became a worldwide hero – the memoir of the world’s first celebrity cat! – was published to great acclaim in versions for adults and children and is currently being translated into several languages. It has recently been followed by Smoky: How a Tiny Yorkshire Terrier Became a World War II American Army Hero, Therapy Dog and Hollywood Star, the memoir of a truly unique little dog. In between her writing she has recently trekked to see Mount Everest; tandem jumped from a tiny plane; been on Canarian TV due to her crazy long fingernails; run a lesbian dining club; escaped from a yoga holiday in a dinghy; and regularly does charity work for Breast Cancer and Gay Pride. She currently spends her time between London, Gran Canaria and Asia.